Alter Ego has been making polishes for years! Cynthia has been creating polishes and soaps and she recently reformulated all of her polishes! Today, I'm sharing two polishes that have been reformulated. What's even better is that Alter Ego is having a Cyber Monday sale for 40% off, so you don't want to miss this! I'll be up front and say I don't even think this polish is available right now. Sorry. I'm not even sure this line is even made anymore since I think The Painted Nail now exclusively sells gel. But it was in a press sample bag I received, therefore, I'm showing it to you. Are you recovering still from a busy and hectic Thanksgiving? I am! So I pulled out some super oldie polishes, and I'm bringing back a Thanksgiving-inspired glitter bomb! I love heading into my stash and pulling out polishes that were from the early beginnings on indies! Hi all! Today I'm sharing with you the Colors by Llarowe December Polish of the Month. With Black Friday deals today, you want to make sure you leave some polish budget aside for this beauty coming out in just a few days! All right guys, let's get to some real talk. Gilmore Girls will be releasing their new season this Friday on Netflix. I have been a HUGE fan of the show, watching it from day 1 when it first aired on WB. I mourned its ending when the CW took over the channel, and had no idea what was good tv, deciding to end Gilmore Girls for reruns on America's Next Top Model (insert eye roll so hard you fall off your chair). I am so excited to see the original creator finally getting to end the show the way she wanted to. So I couldn't let this monumental event pass by without a coffee manicure ode to my favorite show! What's a Thanksgiving season without one turkey manicure? Instead of a realistic turkey, I went with hand turkeys! Remember as a kid, you used to outline your hand, stick feathers on each finger, and bring it home as a turkey drawing?! Well, I've done the same on my nails! Paint Box Polish Snowy Evening and Sanguine Stars Black Friday Duo + Black Friday Sales! Good morning! As we approach Black Friday, we have to keep our wallets ready for the amount of nail polish sales! 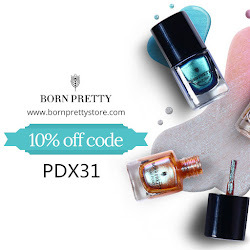 Paint Box Polish is releasing a holiday duo AND you can get it for 29% off WITH free shipping! Yup, keep reading because these are gorgeous! 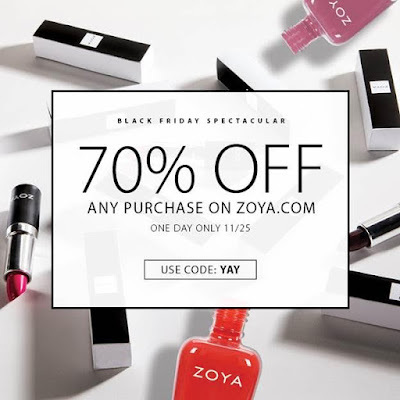 Zoya Nail Polish Black Friday Sale!! Just a quickie post, in case you haven't heard, but here are the details to Zoya's Black Friday sale, which might be the most epic sale EVER. Tell me your favorites below! Or what you plan on picking up! Hello all! I showed you a few Halloween products from Lipsticks and Nail Polish HERE, and now I'm sharing three foodie inspired products! If food scents bother you, stick around because these aren't as sweet as you think! Plus, these are so cute as gift extras and there's an awesome Black Friday sale coming up! Today I'm showing you the Moyra Ornaments stamping plate. This is my first time trying out Moyra but I had always heard good things about their plates. I have certainly slacked on Thanksgiving nail art. Frankly, I can't believe it's next week. As a teacher, Thanksgiving is the end of the semester for me. So wow, time is going by quickly! I wanted to do some fun dots. I'm still hating my short nails and dots make everything better. I've shown some Impala polishes on my blog before and today, I'm sharing two glitters from their new glitter collection that was from this past summer. They are pretty basic in terms of coloring, but it might be great for someone who wants a little sparkle. So today is my parent's wedding anniversary! Last year, I did jade and coral nail art for their 35th anniversary so I decided to do art again for their anniversary this year! 36th anniversary is Bone China. I know what Bone China is, but google helped me to decide on a lacy neutral design. 36 years married is a wonderful accomplishment, so I'm always happy to celebrate with them! Say hello to my new shorties. I had been patching a tear for months on one of my nails and my nails finally said NO MORE, START AFRESH. So I did. And then, I even further filed them in a frenzy after this post, so I hope you don't mind. It's only temporary but man, is it weird to feel my fingertips HAHA. I've been sharing some older swatches I held on to but now, it's my current nails. Ok, on to the polish! I have loved my ittse Royal Plumage Palette so much, I figured I would share the other palette I have, which is much more neutral. I do love playing with funky colors but on a daily basis, I reach for simpler palettes. This is a great option! Hello everyone! Quick NOTD for the weekend. I'm slowly waiting for my nails to grow out a bit, so I have a few swatches to share in the next few days. Hope you don't mind! I would say that I buy lip products more than any other makeup right now. I have a ton of my go-to eyeshadows, but lipsticks? I can't get enough! So today, I'm showing off 5 of the extra creamy round lipsticks from NYX. I recently bought 3 ombre lipsticks from NYX and I'm obsessed, so I expected nothing less than awesome. I have a super pretty polish today, that again, I didn't show for a while since it isn't available. I think it was available for a short time but unfortunately, I didn't know or I would have shown it. Hopefully, it's released again, and you can see these swatches to know that you need to get it! I have a cool polish today that I received while at Cosmoprof. I took a while only because this pretty isn't available for purchase, and I always feel bad posting those! Anyway, at least you can see the fun types of polishes that Firecracker Lacquer makes! Good morning! Today I'm sharing a review of three products from I Smell Great. I Smell Great is the brainchild of the actress Sophia Bush and it's products made in the U.S.A. I'm always curious to try new product and brands, so this was no exception. 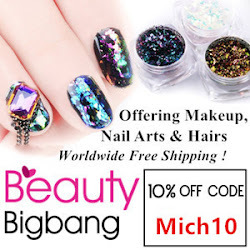 It's the weekend and what better way to show you some gorgeous polishes from Anonymous Lacquer! I actually swatched these back in September (hence my tan) but my nails were short and then I fell behind and my nails were long. Well, now I have some serious shorties, so these nails will be a nice transition. I feel bad forgetting to post these over and over but now let's take a look! All of these are available so yay! So I always see double stamping and I figured, let me try it. I have no idea what the goal was with this particular design, but I like it! Good evening! So a small group of ladies decided to do an Indie Spotlight each month! In the world of indies, there are so many that we sometimes miss out on ones who create small batches of polish. Well, 6 Harts is one of those and we are kicking off Indie Spotlight with the brand. Courtney is a pleasure to work with as a blogger and as a friend. In fact, one of the cuticle oils was made because I requested the scent! More on that in a bit. Check out the links at the end of the post to see more 6 Harts manicures! Facial sheet masks are all the rage! I've only tried one before, but at Cosmoprof, it seemed to be THE biggest skin care item out there. They are everywhere! I received this adorable set of sheet masks, and I was so excited to try out this Biobelle set! And with the holidays coming up, this is an amazing gift to give to anyone who loves beauty and skin products! I cannot believe it is November! Although I'm still rocking my Halloween owls that I shared with you yesterday, I want to share with you my updated Gumball machine nail art that I wore on Saturday. I re-wore my costume from last year mostly because I ran out of time to make the new one that I wanted to :(. But I wanted a different manicure from last year, so I updated my look!